Seattle based Alaska Airlines and rival Delta are really heating up the competition for direct service to Raleigh-Durham, North Carolina. These fares are Saver and Basic Economy on Alaska and Delta, respectively. 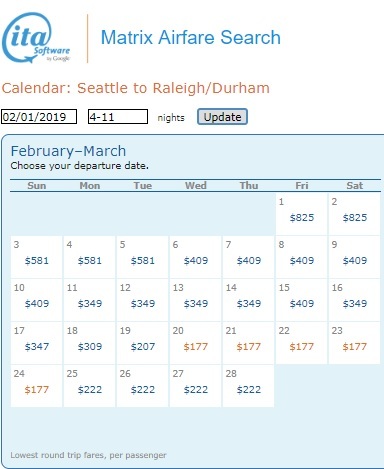 Only a few select dates in late February remain at this price point. Use ITA Matrix Software to find the cheapest dates. Book through Kayak for flight flexibility and frugal fares!